standard 58" belt with rollpin buckle from an ALICE rucksack, nylon seat belt. 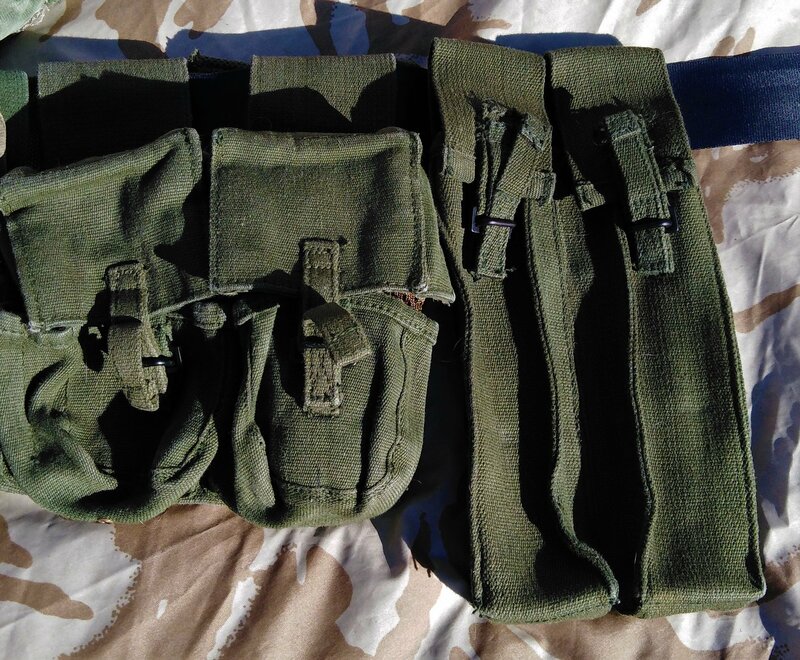 on the belt left to right: Knife pouch, Armalite/M16 pouches, 44" waterbottle, Escape pouch, 44" waterbottle, and SLR pouches. On the rear nothing special, but you can see the new belt loop and repairs I made on the 44" bottles, I carefully stitched the bottles to the ammo pouches (easily removed) to reduce the amount of movement on the belt, I use a 58" yoke (not shown) which helps to stop the rear pouches slipping around, on the front of the yoke I added 44" style C clip like the rear to attatch to the front. and opened nothing much to say here but the 58" has stiffners in the flaps unlike the alti version which can be totally crushed in the hand. 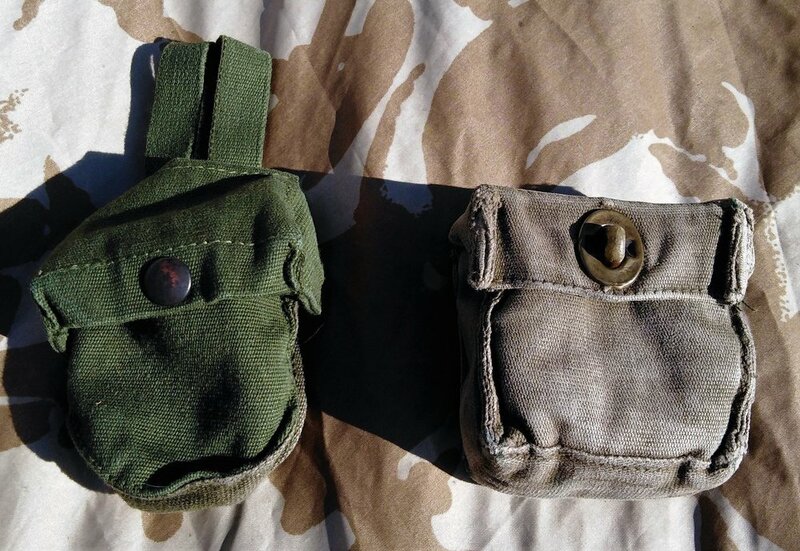 Next a twin SMG ammo pouch a very simplistic design as you can see they are very much like the SAS Drop pouches, in style and fixtures, the lid is a simple flap and it has no waterproof lining, the front clips are identical. The rear of the pouch you can see it is very simple, unlike "SAS" drop pouches there is only one belt height option. 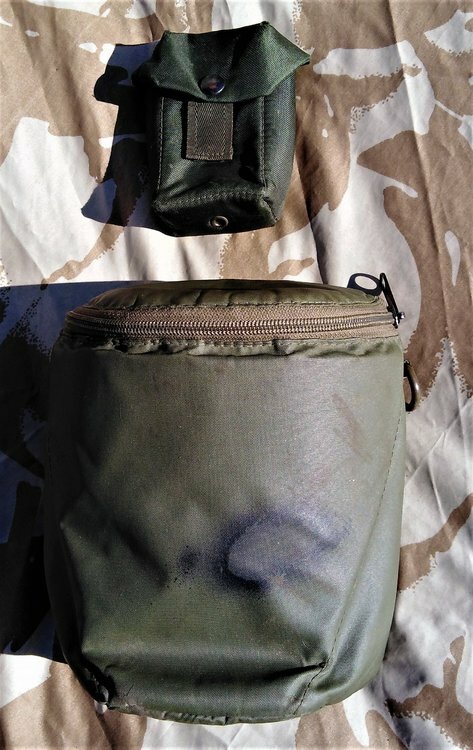 Next 58" Handgun pouch, notice the fasteners are similar to "SAS" pouches, the other Black Handgun pouch, I was given this from an EX RAF Military Policeman aparently everyone got fed up with the canvas versions, as you couldn't get to the gun fast enough, and you couldn't leave the pouch open "ready for use" this was later issued. the odd this is the black version has some metal parts that would be familiar to 58" users it is a simple pull down to unclip the tab from a square ring like all the 58" pouches, on the elasticated web tab a hook that is identical to the hook used to attatch the 58" large pack to the yoke! 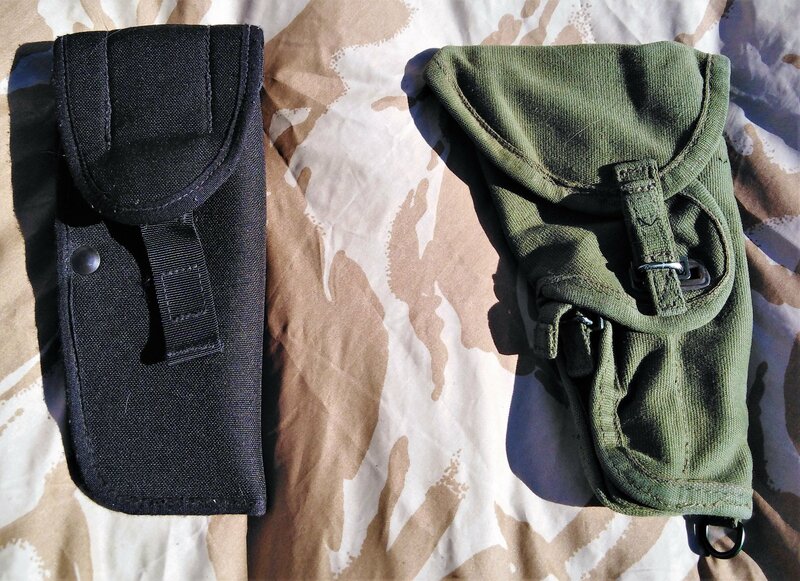 The 58" version has 2 belt attachments, a yoke and leg loop. The black version has 3 hanging heights! 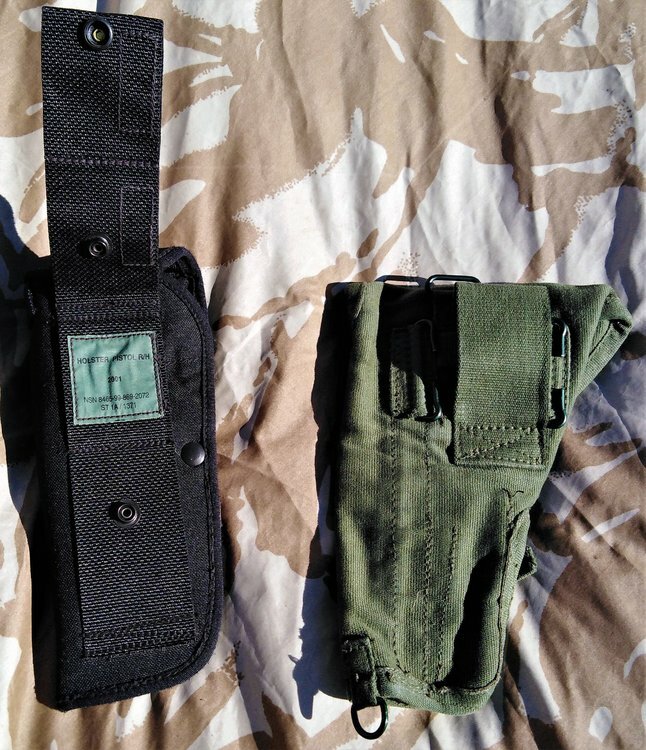 "Holster Pistol R/H 2001 NSN 8465-99-869-2072 ST 1A / 1371 "
The fixtures are obviously closely based on 58" ammo type pouches and the over complex Kidney pouch attatchment. Finally my "uber rare" Green 58" water bottles, yes they are genuine! I don't have the origonal lids they both came with the S10 adapter. Sadly I don't have the even rarer green cups that went with them. cool thing is they are different shades of green and even 2 manufacturers! on the right a standard Osprey bottle. They all have the familiar warning "KEEP AWAY FROM HEAT OR FLAME" and they all have the "crowsfoot arrow"
here you can see the subtle difference in the shape and design the darker left has a curved bac like the modern black version, the other is totally flat. hope you like the kit, as far as I know it's all genuine please feel free to ask anything. For reasons unknown, the F&G one is it’s own unique smaller size compared to all the other P58 water bottles I’ve seen. Presumably it would have had a matching non-standard size mug as well. Hi thanks for commenting, I have seen photos online of matching sets, but as you'd know the cups are more breakable, so I guess they died and were replaced with standard black cups. Just as likely thrown away in favour of the alloy 44" pat cup which was the trend for decades before the crusader cup came along. I had a chat with someone else some years back and they said, the reason they didn't stick with Green was because light could just about get through the plastic and bacteria could grow more easily, so they went with black, same as all the much larger vehicle water containers.I think there is a definite taste difference in water from the green bottles too perhaps it's an early rejected "taste bad" plastic?. 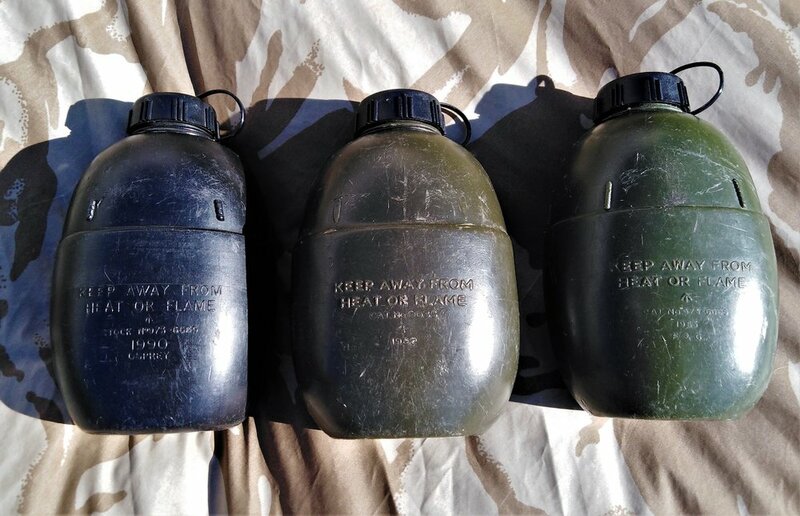 When I picked up the bottles, years ago now, it was from one of those huge 2ft x2ft boxes of surplus just full of mostly black 58" water bottles, I remember them being 50p sadly many had holes, splits, melted areas or were covered in tank tape which I assumed was probably a quick field repair. i picked out a couple of good bottles and the 2 green ones, all had the new S10 lid. 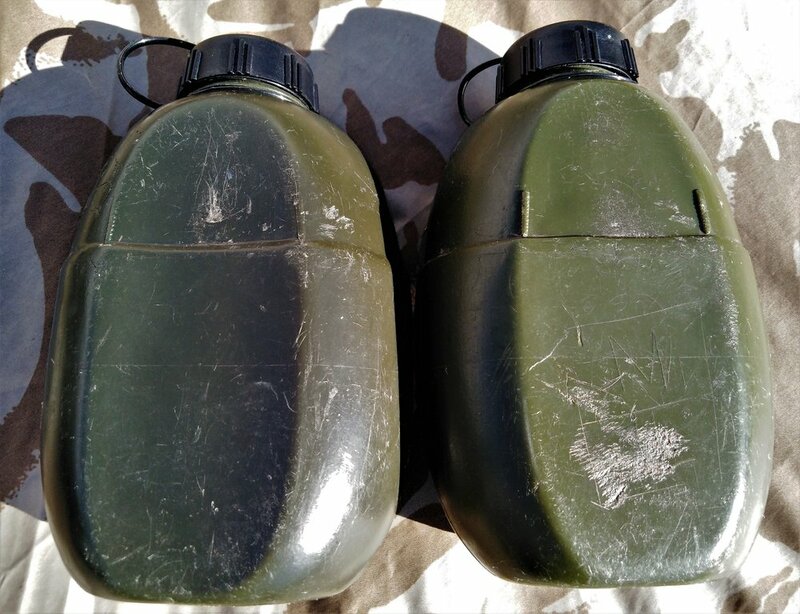 I can only think the company QM or soldier they were last issued to added the S10 lids, as any one else wouldn't have needed the adapter, and the surplus store just wanted the job-lot gone, a shame to think the original lids probably collectable now, just went in a bin! How did you remove the paint from the fabric? IMPORTANT: Meths and petrol can leave stains, so it's importand to wash thoroughly after using them. After that I removed the petrol smell and a fair amount of further residual paint and dirt with a standard washing up brush and liquid. Lots of wrinsing later, there was still quite alot of solid pink paint deep in the fibres some of which i picked out with tweezers I think but I couldn't get it all. too much and you get a dark green blob, you have to know when to stop. 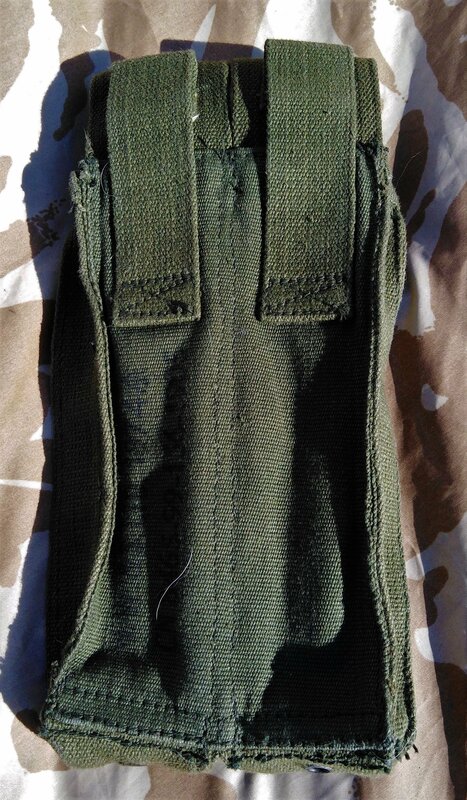 You can see the darker blobs of green around the stitching at the top front of the pouch, but from a short distance you can't tell. If you zoom in on the photo (between the rivets top front) you can still see the pinky and grey paint between the threads that are still coated in paint. the sharpie gave just enough of a blend that the paint dissapeard a bit. 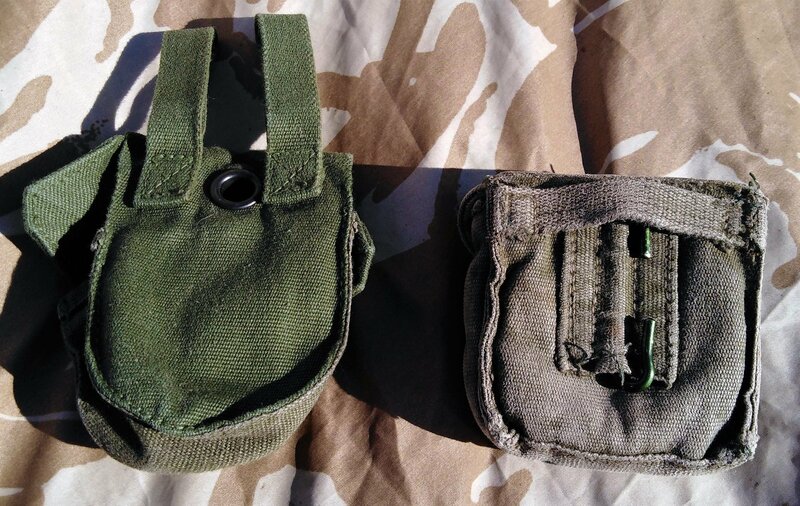 I've done the same with many pouches and even some clothes it always seems to turn out fairly well. Wish I'd done a before and after piccy now, I will next time! I guess If I wasn't collecting it, there is always the option to re-dye a canvas item, but you'd never get the perfect colour and theres so much residual S*** in army surplus gear from engine and gun oil, spilled paint, mud, food grease to various chemicals (even CS gas) the fabric you never quite know how much would soak in. I wouldn't. The patch of light pink that I just couldn't shift and was embedded so far I would have had to cut the material. so I used a sharpie (light grey and dark green I think) firtly in tiny dots then larger dots to camouflage the pink, you have to use a bit of artistic descernment here, too little and you get a spotty pouch too much and you get a dark green blob, you have to know when to stop. You can see the darker blobs of green around the stitching at the top front of the pouch, but from a short distance you can't tell. Do you ever re-dye clothes or pouches? Sorry just edided my oprevious answer which now mentions dying. Basically No! it wouldn't look right. unless all the pouches are the same colour you'll never get the right shade or colour, also the canvas pouches came with a basic waterproofing coating, which would stop dye working in some cases. 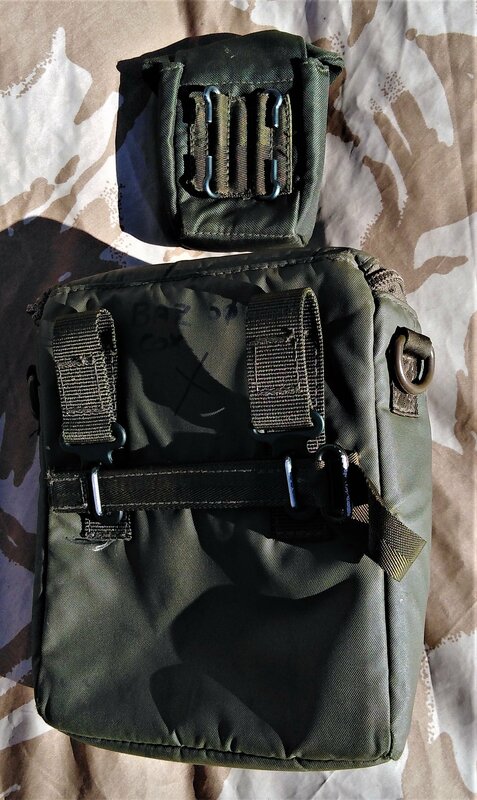 The other thing is this, When I was in the Army, no one was issued (or had) a completely matching set of webbing, the set I was issued was so knackered I had to sew parts of it before I could use it. 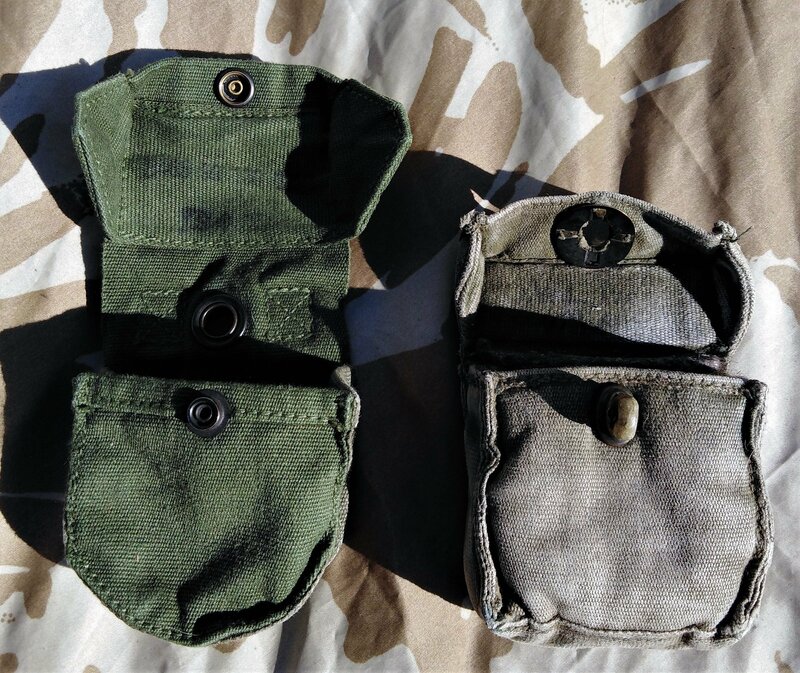 Very few soldiers had "Green pouches" most were that sort of earthy grey colour but mixed with pouches like the resipouch that were much darker the only pouches that were always green were the large pack because it had such little use! Thats interesting, I wonder why they only made black, and why the MoD didn't just continue with an updated 44" cup? Looking at those Sterling pouches. Reminded Me I have two pairs in my collection. Both Mint unissued. I was REALLY lucky with one Pair. 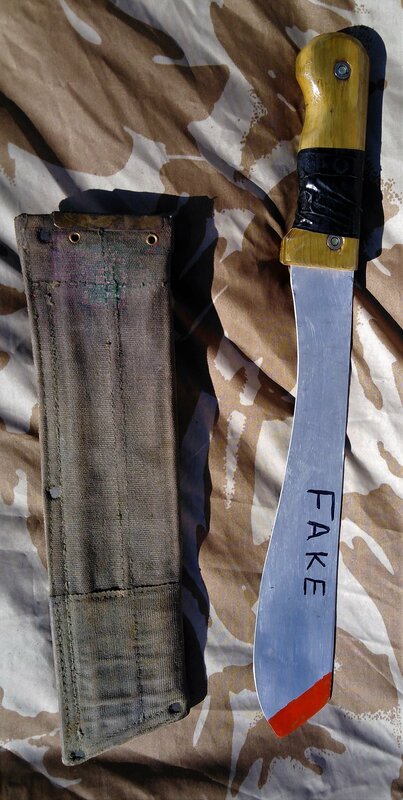 I purchased it at a Militaria Fair, & it had newspaper stuffed inside. This was to pad it out & look 'full/ better' presented on the table top. When I got home I obviously removed the newspaper. Guess what was inside? A sealed pattern label attached with cloth ties & a wax seal! WOW, always a bit of a lucky dip with suplus stuff! I bought an East German "raindrop" camo jacket, rolled up neatly in the pocket, a Parachute Regt tie! Weird what you find sometimes.